Florida basketball has quite a week on it’s hands taking on West Virginia at the Jimmy V Classic at Madison Square Gardens followed by a home game against a 10th ranked Michigan State team. 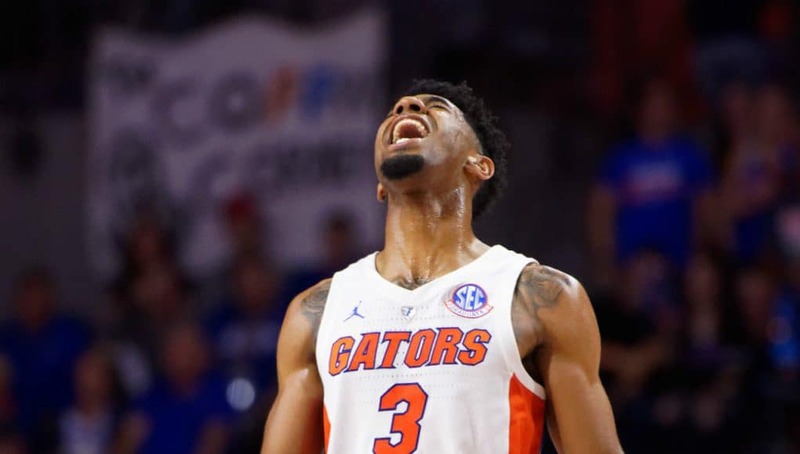 After a disappointing start to the season that sees the Gators at 4-3 with losses against the three best teams they’ve faced this week is an opportunity to pick up some marquee wins and gain some momentum moving forward towards SEC play. Two wins could mean big things for their NCAA Tournament resume and could find them back in the AP Poll while two losses could see the team sputtering at 4-5. How the team does in the next two games could really shape perception around the team and sweeping them could show that this team could be an SEC contender. Here is a preview of what could be one of the most important weeks of the Gators’ season. West Virginia is 5-2 to start the season and how good they really are is still shrouded in a bit of mystery. They haven’t had a tough schedule but have already taken two losses, one to a solid Buffalo squad and another to Western Kentucky. Those schools are the toughest teams West Virginia has faced leaving the Mountaineers’ best wins as Rider, Saint Joseph’s, and Valparaiso. After being ranked #13 in the preseason poll and rapidly falling out of it West Virginia is going to be as hungry for a resume building win as Florida is and it could make for a heck of a matchup at MSG. Since coach Bob Huggins took over the West Virginia job (while current Florida assistant Darris Nichols was on the roster, by the way!) the Mountaineers have been known as “Press Virginia,” a team that was going to play dogged defense the entire length of the floor to wear down and frustrate opponents. Defense was the hallmark of a Bob Huggins team but that actually hasn’t been the case this year as their defense has been lackluster, only 42nd in the country while their offense has been their best attribute clocking them in at 19th. Interestingly enough, they have only played press defense on 32.3% of defensive possessions this season, a number that is pretty shocking given how they have played the last few seasons. Diversity is the strength of their offensive attack as Esa Ahmad (16.6), Sagaba Konate (14.8), Lamont West (13.9), and James Bolden (13.4) all average double figures in scoring and share the load. Though none of those players are super electric with the ball in their hands they play they play a difficult brand of basketball to defend by running a lot of action away from the ball to get cutters going towards the rim. They will easily punish teams that are lazy when guarding away from the ball and will really challenge the communication of a defense by running screens on the weak side. From a hypothetical standpoint Florida’s switching man defense should work well against this by not making defenders have to battle through multiple screens but it will require a lot of focus for the entirety of the shot clock. Esa Ahmad, Lamont West, and Sagaba Konate are all players who get post touches and it’s going to put pressure on Florida’s interior. Many West Virginia possessions start with a big trying to seal his man for an inside look and the Gators will have to look to deny it and instead try to make guards like Brandon Knapper and Chase Harler beat them on the outside. One thing I’m concerned about for this game is the fact that Florida’s switching man defense could get them into trouble on the block. We saw Oklahoma punish the Gators for switching so often by pounding the ball down low when Andrew Nembhard or KeVaughn Allen was switched onto a big and I’d be nearly certain that Bob Huggins saw that and will be doing the same thing. If Florida ends up with a mouse in the house (a small player guarding a big down low) they will need to bring over a double team and that could free up some pretty good Mountaineer 3-point shooters like James Bolden (47.8%), Brandon Knapper (42.9%), and Sagaba Konate (also 42.9%). An interesting storyline to watch will be how the Gators defend on the interior so be sure to watch for how the switching man defense works against the Mountaineers. Sagaba Konate is one of, if not the best shot blockers in the country and the Gators could have some trouble finishing around the rim when he’s patrolling the paint. Though not super imposing at 6’8” he has excellent timing and anticipation and he’s turned away more layups, dunks, and jump shots than just about anyone in the country. After the Gators battle the Mountaineers in New York they’ll head back to comfy confines of the O’Connell Center to take on the Michigan State Spartans. Judging by what we’ve seen so far this season this game is likely to be the tougher of the two but home court advantage gives the Gators a good chance at a fantastic win. The Spartans have had a challenging schedule so far that has seen them take losses to Kansas and Louisville but has also seen them beat Texas, UCLA, and Rutgers. They are ranked 27th in adjusted defensive efficiency while hanging their hat on the other side of floor coming in at the 9th-best adjusted offense. The 18th ranked 3-point shooting team in the country, the long balls come fast and furious and can be absolute backbreakers to their opponents when they come late in the shot clock. With everything the Gators do defensively they’ll always have to think about the 3-point line which could be a major challenge. Much like West Virginia the Spartans love to play through the post and have some bigger bodies they like to do it through. 6’9” 245 Nick Ward, 6’8” 245 Xavier Tillman, and 6’7” 230 Kenny Goins are all muscularly built pivots that orchestrate offense down low and they could be tough matchups for a depleted Florida frontcourt. Coach Tom Izzo loves to get his guards Cassius Winston and Joshua Langford off the ball where they can use their 43.4% and 44.9% 3-point strokes and it means the ball is going to go inside a ton where they can then run sets to free up the shooters. My advice would be to double down on Ward when he gets the ball in the post as he’s converting 47.1% down there but let Tillman and Goins go one on one and challenge them to score. They get the ball on the block looking to pass out and I’d rather see them try to score one on one then have the Gators double down and potentially give up open threes. If you’re the Gators’ frontcourt, stay straight up and make them finish overtop of you and don’t commit any fouls. They’ll miss more than they’ll make. The size Michigan State plays with translates to rebounding where they are the 21st best defensive rebounding and 29th best offensive rebounding team in the nation. For reference, Florida is the 116th best defensive rebounding team and the 210th best offensive rebounding team in the country. As you could probably guess seeing those rankings rebounding could be a major part of this game and it’s a little bit scary from a Gators perspective. Rebounding was one of the major reasons that Florida lost to Oklahoma and the Spartans are an even better rebounding team than the Sooners so there is definitely potential for a problem here. If Isaiah Stokes is healthy, which I’m hearing he is, he could be really valuable for the Gators in this game. Nick Ward or Kenny Goins are some of the purest low post players in the country and these are the matchups the Gators need Stokes to play big in. Expect him to play some more minutes then normal as the Gators try to match strength with strength. If there’s one area I think the Gators could exploit Michigan State it’s with their speed. The Spartans aren’t a particularly fast or athletic team, instead more reliant on their strength and ruggedness. Michigan State has been fairly turnover-prone this season the Gators could definitely punish that with their ability to get steals and run the open court. KeVaughn Allen should be the fastest player on the floor and he’ll have to exploit slower defenders like Aaron Henry and Matt McQuaid when given the opportunity. If this matchup turns into a grind-it-out game it will definitely benefit Michigan State and if it turns into a track meet the Gators should have the upper hand. These will be two interesting games as both opponents love to pound the ball down low and play through their posts. It will be a big week for Kevarrius Hayes, Keith Stone, Dontay Bassett, and Isaiah Stokes to stand their ground and play big and the success of this week could very much hinge on them. After an offensive explosion Against North Florida last Tuesday you probably wish the Gators could have played right after that to keep the offensive rhythm going but you’ll also have to hope a week of practice will have the team executing at a higher level with the ball. Both West Virginia and Michigan State have been historically great defensive programs but are both down in that area this season and it could be a chance for the Gators to hit some shots and get their confidence up. We know they’ve been able to defend but how they can put the ball in the hoop against quality power conference opponents will be the question. For the record, KenPom predicts the Gators winning both games by a slim margin of a single point.